Following are some of my favorite places where God has enabled me to see my value as a woman, specifically as His daughter. This planet is an amazing gift from a loving Heavenly Father. I’ve stood awestruck as Jerusalem’s limestone streets and buildings turned to gold in the morning sun. I’ve explored pyramids and bamboo forests, stone circles and turtle beaches. I love this magnificently beautiful earth. While the flora and fauna fill me with wonder, the people, especially the women that I’ve seen and met, have changed my life. I love being a member of our global community. The Savior said, “Remember the worth of souls is great in the sight of God” (Doctrine and Covenants 18:10). God doesn’t distinguish between man or woman. The worth of every soul is great to Him, and should be to us as well. I love being a Latter-day Saint. I believe that Jesus Christ is the Son of God who came to earth to atone for the sins of mankind. He gives us commandments that enable us to grow, repent, and accept His Grace. I believe that we are children of God, and that as our Father, God’s greatest desire is for us to return to live in His presence after this life. The Church encourages me to strengthen my relationship with Deity through prayer, scripture study, and service to others. I have never been told that my curiosity should be curbed or that I should just accept what someone else has said. I believe that God answers honest prayers of those seeking truth. He has answered my prayers to know if this is His true Church. 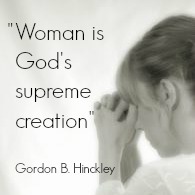 As a Mormon woman, I belong to the oldest and largest organization for women in the world, the “Relief Society.” About six million women belong to this organization which was founded in 1842. 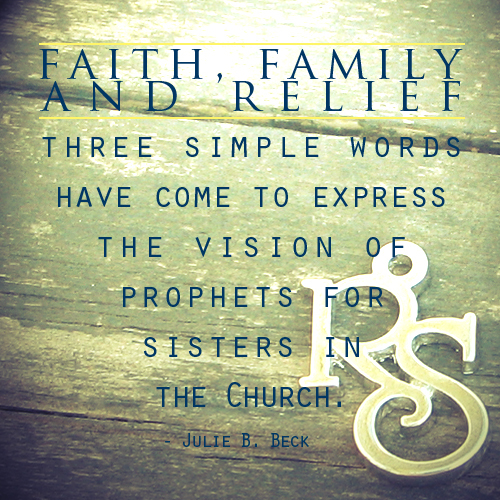 “Charity never faileth” (1 Corinthians 13:8) is the Relief Society’s motto. Its official purpose, as stated in the Church Handbook of Instructions is to “prepare women for the blessings of eternal life by helping them increase their faith and personal righteousness, strengthen families and homes, and help those in need.” I love belonging to a community of Saints. I’ve noticed that women have a deep yearning for connection with other women. One program of Relief Society is called Visiting Teaching. Two women from the congregation are assigned to minister to certain other women in the congregation. The purpose of Visiting Teaching is for each woman in the congregation, whether actively involved in the Church or not, to be ministered to by other women each month. Ideally, the visit takes place in each woman’s home. I have met with women in many other locations, too, but I really love visiting women in their homes. Soon after moving to Punaluu, Hawaii, I was given the assignment of visiting four older Hawaiian ladies, who all happened to be sisters. I had just experienced a miscarriage, moved to a new location where I knew no one, and felt quite blue. But, my conviction of the importance of Visiting Teaching compelled me to visit these ladies who all happened to be together in one sister’s small apartment when I met with her. I learned about their lives and how several of their husbands and children had passed away. Without too much effort on my part, I felt their compassion, and our unity as women and sisters. During our brief visit, I felt the love of God, my burden lifted, and my hope restored. While I was “assigned” to minister to them, they actually ministered to me. That’s the beauty of the Gospel of Christ. As sisters in the Gospel, we “are willing to mourn with those that mourn; yea, and comfort those that stand in need of comfort, and to stand as witnesses of God at all times and in all things, and in all places” (Mosiah 18:9). I love being part of such a wonderful sisterhood. While not one who loves excessive cooking for two—me and my husband—one way I love to serve others is with food. A quick treat and a note is a wonderful pick-me-up, and I love dropping treats off at a door and running away to stay anonymous. When I don’t really have the words to comfort someone’s distress, I can take a meal to reduce a little stress. I have also benefited from others’ generosity in this regard. “[W]hen ye are in the service of your fellow beings ye are only in the service of your God” (Mosiah 2:17). I love the kitchen when our extended family gathers for food, games, or just to chat around the table. These times help me feel so close to them and remind me of the great blessing I have to be a daughter, a sister, an aunt, a niece, a cousin, and a friend. I love being a member of a family who loves me. I love learning! One of my favorite ways to learn is to dive into someone else’s thoughts. While I typically read nonfiction, I still enjoy a compelling story, too. Reading is a therapeutic release for me as well as an opportunity to expand my mind. I am amazed at the human spirit! I’m grateful for the thinkers, innovators, and recorders throughout history. My favorite and most consistent reads are scripture. I read the scriptures daily. Through their verses, my mind is expanded, and my soul gains that peace, hope, and assurance of God’s existence and love. “Peace I leave with you, my peace I give unto you: not as the world giveth, give I unto you. Let not your heart be troubled, neither let it be afraid” (John 14:27). This may seem redundant with my comments about the World, but rather than traveling and seeing new cultures and places, with “Nature” I mean that I just really love being outside. I am typically “unplugged” while taking a walk or driving through a canyon. It is special time spent alone, or with my husband, and with God. “Behold the heaven and the heaven of heavens is the Lord’s thy God, the earth also, with all that therein is” (Deuteronomy 10:14). Last year, for the first time, I visited the Sacred Grove, where Mormons believe that the Prophet Joseph Smith physically saw God the Father and Jesus Christ. I’ve stood in other sacred sites and know that God often reveals Himself to us in the midst of His beautiful creations. Temples of The Church of Jesus Christ are structures dedicated to sacred ceremonies and ordinances Mormons believe are necessary to return to live with God again in the highest kingdom of heaven, the Celestial (see 1 Corinthians 15:40-42). In the Temple, I learn of God’s plan of salvation—that as God’s children, we lived before we were born on this earth, that there is a purpose to this life, that we will live again after we die, and most importantly that this is possible through the grace and mercy of Jesus Christ. In the Temple, I was married for “time and all eternity” and believe that the relationships most dear to me will continue after death. For me, the Temple is a sanctuary from the world. “When my soul fainted within me I remembered the Lord: and my prayer came in unto thee, into thine holy temple” (Jonah 2:7). Wherever my husband and I live, we find a spot where we discuss our relationship, ourselves, or life in general. On Oahu, this spot was a collection of lava rocks on the beach in front of our house where we sat to make decisions and talk through heartaches and concerns. This place is where I pour my out my soul to God. “And when I did turn unto my closet, O Lord, and prayed unto thee, thou didst hear me” (Alma 33:7). This place is where He tells me of my purpose in this life and how I can contribute to building up His Kingdom. This is the place where I am finally still. “Draw near unto me and I will draw near unto you; seek me diligently and ye shall find me; ask, and ye shall receive; knock, and it shall be opened unto you” (Doctrine and Covenants 88:63). As a Mormon woman, I feel fulfilled and cherished. My life has purpose and direction. When trials and heartaches come, my faith in Jesus Christ brings peace. If you would like to learn more about God’s purpose and direction for His daughters and His sons, please contact the Mormon missionaries. I know that God lives and that He loves us!